Let’s All Freak Out About The P/E Ratio! Here’s the thing. Earnings have collapsed. Utterly and completely. Like a house of cards. Like never before. Honestly, my initial reaction was to ignore this latest chart. First, because we already went over this months ago when the P/E ratio was 122: How The Price Earnings Ratio Can Fool You. But also because this whole issue is truly meaningless. But then I realized that this chart is making the rounds on the internet at a torrid pace. It is being forwarded and many other bloggers are featuring it with a bearish slant. So while it really is a distraction, perhaps there’s something of value here. Not the data set graphed but rather the reaction of people and their fixation on this useless little statistic. If anything, the morbid fascination with the gloomy and shocking picture the above chart depicts tells us about the public mood out there. And from a contrarian point of view, this is the sort of ‘worry’ that bull markets proverbially like to climb. Earnings of companies represent the ability of companies to pay dividends. And although companies can borrow money and keep paying good dividends despite poor earnings, eventually poor earnings will result in poor dividends or no dividends at all. GM is a good example of that. GM was loosing money for years and years. But that didn’t stop GM from paying good dividends to its shareholders. Because GM was able to borrow lots and lots of money for its operations and for the dividends. But eventually GM went bankrupt. And those investors who chose to ignore very high P/E ratios of GM ended loosing a lot of money on their GM investments. Ignoring high P/E ratios and looking only at dividends is the same as betting that the dip in the company’s earnings is temporary and not permanent. Which might or might not be true. Every bet has an inherent risk. And you should be aware of the risks you take when you choose to ignore high P/E ratios. Nick, P/E is a backward not forward indicator. All it tells you is what you already know. Where’s the edge in that? A backward indicator is an indisputable fact that has already happened. Whereas a forward indicator is only an iffy guess, because there is no perfect indicator that can foretell you the future. It’s true you have to make a guess about the future and take a risk. But you should be aware of all the risks you take. Just because the earnings of companies are poor now now doesn’t mean that earnings of companies will remain poor in the future. But there is some possibility that company earnings will remain poor for a long time due to high unemployment, high consumer indebtedness, and the resulting poor consumer demand for goods and services. It’s a matter of opinion whether company earnings will recover soon or not. But completely ignoring the poor earnings of companies now is like predicting with absolute certainty that company earnings will recover soon, and they will recover a lot. And I’m not so sure it’s wise to be so certain in your predictions about the future. Because nobody knows the future this well. Babak, I’ll side with Nick on this one. the P/E gives you an indication about the price you are also paying for a company’s share of future earnings. At the current PER (about 140) the value of the stock market would need to be divided by 20 — or decline by 95% — to reach a normal bottom on a bear market (that would mean the S&P 500 trading at about 50 !) or the total earnings of the 500 biggest US companies need to rise by 2,000%. Or anything in between. For example you should have a decline of about 50% if the US companies increase their earnings 10 fold (i.e. by 1,000%). This is how realistic the current market is. 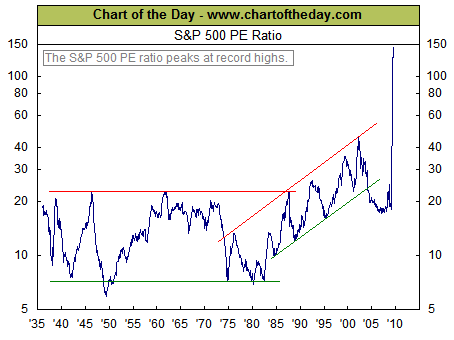 Also, as you can see, never in history has the P/E reached those levels. As a contrarian, maybe you should worry that everybody thinks P/E doesn’t matter anymore, and that we are a new era, where a P/E 4 times as high as the highest P/E in history can be reached during the Greater Depression and have no consequences. The “once in a lifetime bargains” occur when P/E is around 7, not around 140. We had a similar discussion about a month ago. It is my opinion that P/E is only relevant if the E is defined as an accurate estimate of what future earnings will be with the key adjective being “accurate”. Also the future earnings should then be put into context by comparing to prevailing interest rates. 18 is a the historic norm. But history suggest that when interest rates are low (10), P/E’s tend to range in the 8-12 area. This range depends on investors aversion to risk at that time. If you wish to tackle the comparison of interest rates and earnings, I suggest that you focus on the earnings yield which is the P/E inverted. Trailing earnings are only useful as the primary starting point for estimating what future earnings are going to be. Below are the quarterly Earnings for the last 12 quarters. The E in P/E can be defined as any measure of earnings that the user defines. Most analyst use 1 year trailing earnings, which is terribly misleading at this point in history because of the anomaly in the 4th quarter of 2008. Some analyst like Shilling make a case for mean reversion and uses trailing 10 year earnings. Some observations. 1) As noted in the above charts and discussions , the PE based on a trailing 12 mont earnings (using P=1025.57) is 131.147. 3) If you think the earnings (13.82), we experienced in the last quarter are more representative of what we see in the future, you get a P/E of 18.55, which with interest rates in the 0-3 range would be considered very reasonable. In my model, I use an earnings estimate that is based on an exponentially weighted moving average of the last 10 quarters that is then adjusted for the direction in leading economic indicators. My estimate (42.3) of PE is probably a little high at this time, but much more reasonable than the 131 yielded from standard PE calculations. Again the -23.25 earnings in the 4th quarter of 2008 is a once in a century phenomena that has caused the majority of analyst to reevaluate the way that they use trailing earnings for valuation measures. Thanks for the fantastic comment wayne. I also think that the credit bubble we experience was a once in a century phenomena, and that the consequence are going to be really bad. And the kind of earning the financial industry was making is not going to come back ANY TIME SOON. Even the current “profits” showed by the banks are just smoke and mirrors because mark to market is not applied anymore. If you’re able to pull some data quickly, I would be curious to see a chart of the percentage of the S&P 500 earnings coming from the financial industry in the last 10 years. I have seen that data somewhere, but I don’t have access to it at this time. I didn’t mean to suggest ignoring the quarters that companies lose money, but I suggest that you need to look at more than simply the last 4 quarters. As I mentioned I use a 10 quarter exponentially smoothed E. For those using a simple 4 quarter E, the PE will magically go from some number in the 100s to some number in the 30s at the end of the 4th quarter. I have toyed around with the idea of using the last N quarters and throwing out both the high and low. There are endless ways to approach it, but the bottom line still comes down to what are you paying for future E.
I notice that Standard and Poor’s estimate (7.50) of 2nd quarter earnings was far under the 13.82 observed because as most do they were relying heavily on the first quarter estimate as a guide. They have currently taken down all estimates from their site for future earnings estimates pending review because the truth is there is so much uncertainty at this time, that only the very astute have a good guess. One other comment, I really don’t know many market timers that have been around for 20-30 years that rely heavily on valuation as a timing tool. Although Price to E is a factor, history suggest that whether stocks go up in the future will be driven more by whether E exceeds expectations and whether the amount of investment cash available than whether PE falls within some historic norm. I need to proofread my post better, I meant to type that PEs have historically averaged close to 18ish and when interest rates are low(10) they tend to range between 18-25.